For the baseball player, see Brendan Rodgers (baseball). Brendan Rodgers (born 26 January 1973) is a Northern Irish football coach and former player who is the manager of Scottish Premiership club Celtic. In 2008 he was appointed manager of Watford, where he remained until accepting an offer to become manager of his former club Reading in 2009. He left the club by mutual consent after disappointing results six months later, returning to full-time management with Swansea City in 2010. He led the club to win promotion to the Premier League, the first Welsh team ever to do so, before guiding them to finish 11th the following season. On 1 June 2012, Rodgers accepted an offer to become the new manager of Liverpool, whom he led to runners-up position in the league in the 2013–14 season before his dismissal in October 2015. He became manager of Celtic in May 2016. His son, Anton, currently plays for Swindon Town. Rodgers was born in the seaside village of Carnlough in County Antrim, Northern Ireland. His father Malachy was a painter and decorator, while his mother Christina was a volunteer for the Irish charity, Trócaire. Brendan is the eldest of five boys. His younger brother Malachy became a well-known country and western singer locally and is now pursuing a career in Nashville. He grew up as a supporter of Sheffield Wednesday and Celtic. Brendan's father was a Catholic, while his mother was a Protestant. He attended the All Saints Catholic Primary School in Ballymena, and then moved on to St Patrick's College in the town until the age of 16. "The fact that one [of his parents] was Catholic and one was Protestant didn't play any real part in their lives, they never let the whole religious thing have an impact on Brendan and his brothers" explained his cousin Nigel Worthington, the former manager of York City, and former Northern Ireland manager. In 2010, Christina died at the age of 53, and in September 2011 Brendan was by his father's side when he lost his battle with cancer, aged 59. As a teenager, Rodgers represented Northern Ireland at schoolboy level, notably playing against Brazil in 1988. He also represented the Republic of Ireland at schoolboy level. He began his senior career as a defender for Ballymena United, his local team, in 1987. He was signed by Reading three years later at the age of 18, where he played in the reserves. His professional playing career was ended at the age of 20 due to a genetic knee condition. Following this enforced retirement, Rodgers spent several years playing in non-league football for Newport, Witney Town and Newbury Town, while remaining as a youth coach at Reading. Rodgers spent a large amount of time travelling around Spain studying different coaching methods, and was eventually invited by manager José Mourinho to leave his role of Academy Director at Reading and join the Chelsea Academy as their head youth coach in 2004 after a recommendation by Mourinho's assistant and future Premiership manager Steve Clarke. He was promoted to reserve team manager two years later, and was kept in that position by subsequent Chelsea managers Avram Grant and Luiz Felipe Scolari. On 24 November 2008, Rodgers left Chelsea in order to become the manager of Championship side Watford. Rodgers won only two of his first ten league games as manager, leaving Watford in the relegation zone by January. Watford's form dramatically improved however, and Rodgers was able to guide them to finish 13th, avoiding relegation. Weeks after guaranteeing Watford's survival, and following the resignation of Steve Coppell as Reading manager, Rodgers quickly became the favourite to succeed him and rejoin his old club. He initially distanced himself from reports linking him with the job, saying that his "concentration (is) fully on Watford". However, he eventually agreed a deal to become the new manager of Reading on 5 June 2009, after a compensation package worth an initial £500,000 with Watford was agreed, which later rose to £1 million. The Watford Supporters' Trust stated that Rodgers' reputation was "severely damaged" in the eyes of the supporters as a result of the move, but they nevertheless "thanked (Rodgers) for his efforts last season" and "(wished) him well for the future". On 11 August, Rodgers got his first win as Reading manager with a 5–1 win over League Two side Burton Albion in the first round of the League Cup. Despite a good start in the league, a disappointing string of results followed, and Rodgers left Reading by mutual consent on 16 December, just over six months after his arrival, with Reading one place above relegation in the Championship. Rodgers accepted an offer to become the manager of Championship side Swansea City on 16 July 2010. Prior to this appointment, he had had talks with regard to joining the coaching staff at Manchester City under manager Roberto Mancini. His beginning as Swansea manager was very successful, leading to Rodgers being awarded the Championship Manager of the Month Award for February 2011 after Swansea won five out of the six league games they played that month, while keeping four clean sheets. By 25 April 2011, Rodgers had managed to comfortably secure Swansea City's place in the 2011 Championship Play-Offs for promotion into the Premier League, with a convincing 4–1 victory over Ipswich Town at the Liberty Stadium. 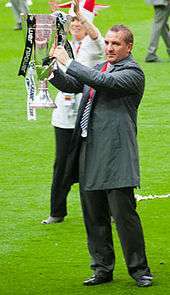 On 16 May 2011, Rodgers led Swansea to the 2011 Football League Championship Play-Off Final after defeating favourites Nottingham Forest over two legs in the semi-final. He faced his old club Reading in the final at Wembley Stadium on 30 May 2011, which Swansea won 4–2 thanks in part to a hat-trick from Scott Sinclair, meaning Swansea became the first Welsh team ever to gain promotion to the Premier League. Rodgers was praised by the media and supporters for consoling Reading manager Brian McDermott and owner John Madejski before receiving the trophy. Rodgers' first win as a Premier League manager came on 17 September 2011, when Swansea beat West Bromwich Albion 3–0 at the Liberty Stadium. Despite many predicting before the season began that Swansea were favourites to be relegated, their debut season proved very impressive, as they picked up points against Liverpool, Newcastle United, Tottenham Hotspur and Chelsea, keeping them well above the relegation zone. In January 2012, Swansea claimed their first away win of the season at Aston Villa, a month which also saw them beat Arsenal 3–2 at home and hold Chelsea to a 1–1 draw. This saw Rodgers earn his first Premier League Manager of the Month Award. In February, Rodgers signed a new three-and-a-half-year contract to keep him at the club until July 2015. 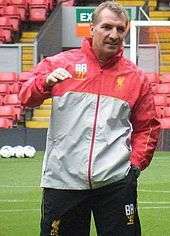 On 1 June 2012, Rodgers was unveiled as the new Liverpool manager on a three-year contract, following the departure of Kenny Dalglish two weeks previously. Rodgers' appointment was immediately endorsed by former colleague and Real Madrid manager José Mourinho. In July 2012, Rodgers wrote an open letter to the Swansea City supporters, thanking both the staff and supporters for his time at the club, and wishing them well for the future. Days later, Rodgers held his first training session at Melwood as the squad reported back for pre-season training. On 2 August 2012, Rodgers oversaw his first competitive game as Liverpool manager, a 1–0 win in the UEFA Europa League against FC Gomel, and won his first home game in charge in the second leg one week later. In his first league game as manager on 18 August, Liverpool lost 3–0 against West Bromwich Albion at The Hawthorns. His first win in the league came against Norwich at Carrow Road, Liverpool winning 5–2. On 31 October, Rodgers welcomed his former club Swansea to Anfield in the fourth round of the League Cup, a match Liverpool lost 3–1. On 6 December, Liverpool defeated Udinese 1–0 away in the Europa League to qualify for the last thirty-two as group winners. On 27 January 2013, Liverpool were knocked out of the FA Cup in the fourth round, surprisingly losing 3–2 to League One team Oldham Athletic. Liverpool finished in seventh position in the Premier League in his first season in charge, one position higher than the previous season. At the start of the 2013–14 season, Rodgers was named the Premier League Manager of the Month for August 2013 as Liverpool won their first three league games of the season. In January 2014, he was fined £8,000 after making comments about referee Lee Mason after a 2–1 loss to Manchester City in December 2013. He was later named Manager of the Month for the second time that season for March 2014, after Liverpool won all five of their games that month to go top of the Premier League. A run of eleven wins in a row for Liverpool left them five points clear at the top of the Premier League with just three games to go. However, they then suffered a 2–0 home defeat to Chelsea on 27 April. This result handed the advantage to Manchester City in the title race. In their next game away to Crystal Palace on 5 May, Liverpool led 3–0 with eleven minutes to go, but the game finished 3–3. Liverpool scored 101 league goals in the season, the club's most since the 1895–96 season and the third-highest in Premier League history. Later that month Rodgers was awarded the LMA Manager of The Year Award becoming the first Liverpool manager to win the prestigious accolade in its 20-year history. On 26 May 2014, Rodgers signed a new four-year contract at Liverpool. Liverpool were eliminated from the 2014–15 UEFA Champions League after drawing against FC Basel in their final group match, dropping into the Europa League. The Reds were subsequently knocked out in the Europa League round of 32 after losing 4–5 on penalties to Turkish side Beşiktaş. On 19 April 2015, Liverpool were defeated by Aston Villa in the FA Cup semi-final. Liverpool finished the season with a 6-1 defeat to Stoke, ending up 6th in the Premier League. This meant Rodgers became the first Liverpool manager since the 1950s not to win a trophy after three seasons in charge. Despite this, Rodgers fully received the backing of Liverpool's owners. On 4 October 2015, Liverpool played their 225th Merseyside Derby against Everton with the game ending again in a 1-1 draw. This was the fifth time in Liverpool's previous six games that they had taken a 1–0 lead, then to have the game end in a 1–1 draw; while they had just one win in their previous nine games. Just one hour after the game, Rodgers was sacked, leaving Liverpool in tenth place after eight games. Later it became known that the decision to sack him had already been made prior to the match against Everton. The following day Rodgers released a statement through the League Managers Association stating, "I am, of course, incredibly disappointed to be leaving ... (but) it has been both an honour and a privilege to manage one of the game’s great clubs." Rodgers was appointed manager of Scottish Premiership champions Celtic on a 12-month rolling contract on 20 May 2016, following the exit of Ronny Deila. On 12 July, in his first competitive game in charge, Celtic lost 1–0 away to Gibraltar's Lincoln Red Imps in the first leg of their second qualifying round of the 2016–17 UEFA Champions League. He said of the surprise result "There is obvious disappointment. There is no embarrassment". On 23 August 2016, Celtic qualified for the group stage of the 2016–17 UEFA Champions League for the first time in three years after a 5-4 aggregate victory over Hapoel Be'er Sheva. In the first game of the group stage, 13 September 2016, Rodgers suffered a 7–0 defeat, his biggest against Barcelona at Camp Nou. On 27 November 2016, Rodgers won his first ever trophy as a manager as Celtic beat Aberdeen 3–0 in the final of the Scottish League Cup. The win also gave Celtic their 100th major trophy. 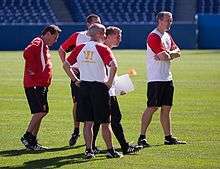 Rodgers overseeing a Liverpool training session with his coaching staff in 2012. Rodgers believes in his teams keeping possession of the ball and playing a flowing passing game with the ball always moving; defensively, he likes his team to put a lot of pressure on the opposing team. His Liverpool team during the 2013–14 season interchanged from 4–5–1 to 3–5–2 to 4–4–2 to 4–3–3 to a diamond formation. Steven Gerrard described Rodgers' one-on-one management as the best he has seen. Rodgers separated from his wife Susan in the summer of 2014 and divorced in December 2015. The couple have two children, a son, Anton, who plays as a midfielder for Swindon Town, and a daughter, Mischa. Rodgers got engaged to Charlotte Searle in February 2016. In June 2011, Rodgers joined a team representing The Football League to climb Mount Kilimanjaro in aid of Marie Curie Cancer Care in honour of his mother – who died in 2010 – and his father – who died of cancer in 2011. In June 2014 he was awarded an honorary Doctor of Science degree by the University of Ulster. Rodgers speaks Spanish and Italian. His nickname is "Buck Rodgers", after the comic strip character Buck Rogers. ↑ "NISFA U15 & U16 International Players". tiscali.co.uk. 1 2 "Swans boss Brendan Rodgers pays tribute as father loses cancer fight". Belfast Telegraph. 12 September 2011. 1 2 3 "Brendan Rodger's voyage: From hills of Antrim to Anfield". Irish Independent. 5 April 2014. Retrieved 8 April 2014. ↑ "Rodgers was a big Owls fan". The Reading Chronicle. ↑ "NISFA U15 & U16 International Players". Northern Ireland Schools Football Association. Retrieved 10 March 2013. ↑ "From School to Full". Northern Ireland's Footballing Greats. 27 January 2007. Retrieved 10 March 2013. ↑ "Chelsea ready for Milk Cup debut". BBC Sport. 12 May 2005. Retrieved 23 November 2008. 1 2 "Bold Brendan Rodgers shows how football should be played". Daily Express. London. 15 January 2012. Retrieved 19 May 2012. 1 2 Spackman, Conor (31 May 2011). "Brendan Rodgers: Getting to the top the hard way". BBC News. Retrieved 30 May 2012. ↑ "Ex-Newport coach on verge of Anfield move (From Daily Echo)". Daily Echo. 30 May 2012. Retrieved 25 October 2012. ↑ Dillon, John (23 September 2011). "Brendan Rodgers learnt the hard way". Daily Express. London. Retrieved 30 August 2012. ↑ Everard, Aleck (1 June 2012). "New Liverpool Manager Played For Witney". Witney Town F.C. Retrieved 30 August 2012. ↑ "Rafael Benitez crisis: Chelsea had Mourinho, Rodgers, Villas-Boas and Clarke - now they are full of resentment". Daily Mail. 28 February 2013. 1 2 3 "Rodgers named new Watford manager". BBC Sport. 24 November 2008. Retrieved 19 April 2012. ↑ "Watford 2008–2009 results". Statto. Retrieved 19 April 2012. 1 2 3 "'If money talks Watford's Brendan Rodgers going to Reading is a done deal'". Watford Observer. 13 May 2009. Retrieved 29 December 2009. ↑ Smith, Frank (14 May 2009). "Brendan Rodgers: 'Reading? I'm concentrating fully on Watford job'". Watford Observer. Retrieved 29 December 2009. ↑ Frank Smith (22 May 2009). "'No contact at all' from Reading for Brendan Rodgers". Watford Observer. Retrieved 30 May 2012. ↑ "Rodgers confirmed as Reading boss". BBC Sport. 5 June 2009. Retrieved 5 June 2009. ↑ "Club disappointed as Rodgers departs". Watford F.C. 4 June 2009. Retrieved 29 December 2009. ↑ Matthews, Anthony (4 June 2009). "Watford supporters' organisation hoping for quick appointment". Watford Observer. Retrieved 29 December 2009. 1 2 "Boss Brendan Rodgers leaves Reading by mutual consent". BBC Sport. 17 December 2009. Retrieved 29 December 2009. 1 2 Dulin, David (16 July 2010). "Swansea City appoint Brendan Rodgers as new manager". BBC Sport. Retrieved 18 July 2010. ↑ Wilson, Paul (25 August 2012). "Brendan Rodgers' sales spiel entices Nuri Sahin to Liverpool". The Guardian. London. Retrieved 31 August 2012. 1 2 "Brendan Rodgers secures monthly accolade". BBC Sport. 4 March 2011. Retrieved 3 May 2011. ↑ "Swansea 4 – 1 Ipswich". BBC Sport. 25 April 2011. Retrieved 3 May 2011. ↑ "Darren Pratley finishes off Nottingham Forest to take Swansea to final". The Guardian. London. 16 May 2011. Retrieved 24 May 2012. 1 2 "Reading 2 Swansea City 4: match report". The Daily Telegraph. London. 30 May 2011. Retrieved 30 May 2011. ↑ "Championship play-off final as it happened". BBC Sport. 30 May 2011. Retrieved 31 October 2012. ↑ "Swansea 3 – 0 West Brom". BBC Sport. 17 September 2011. Retrieved 27 September 2011. ↑ "Liverpool 0 – 0 Swansea". BBC Sport. 5 November 2011. Retrieved 9 February 2012. ↑ "Newcastle 0 – 0 Swansea". BBC Sport. 17 December 2011. Retrieved 9 February 2012. ↑ "Swansea 1 – 1 Tottenham". BBC Sport. 31 December 2011. Retrieved 9 February 2012. ↑ "Swansea 1 – 1 Chelsea". BBC Sport. 31 January 2012. Retrieved 9 February 2012. ↑ "Aston Villa 0 – 2 Swansea". BBC Sport. 2 January 2012. Retrieved 9 February 2012. 1 2 "Swansea boss Brendan Rodgers & Tottenham's Gareth Bale rewarded". BBC Sport. 4 February 2012. Retrieved 9 February 2012. ↑ "Swansea 3 – 2 Arsenal". BBC Sport. 15 January 2012. Retrieved 9 February 2012. ↑ "Brendan Rodgers signs new Swansea City deal". BBC Sport. 9 February 2012. Retrieved 9 February 2012. 1 2 3 "Liverpool and Swansea agree Brendan Rodgers compensation". BBC Sport. 31 May 2012. Retrieved 6 October 2012. ↑ "Brendan Rodgers saddened to leave Swansea for Liverpool". BBC Sport. 1 June 2012. Retrieved 6 October 2012. ↑ "Brendan Rodgers given ringing endorsement by Real Madrid manager Jose Mourinho". The Daily Telegraph. London. 1 June 2012. Retrieved 1 June 2012. ↑ "Liverpool FC boss Brendan Rodgers writes open letter of thanks to former club Swansea City". Liverpool Echo. 7 July 2012. Retrieved 10 July 2012. ↑ "Liverpool midfielder Alberto Aquilani seeks clarity over future at Anfield after two seasons on loan". The Daily Telegraph. London. 4 July 2012. Retrieved 10 July 2012. ↑ "Rodgers: Fight for Liverpool or leave". ESPN Soccernet. 5 July 2012. Retrieved 10 July 2012. ↑ "Brendan's Gomel pride". Liverpool F.C. 2 August 2012. Retrieved 23 August 2012. ↑ "Baggies condemn Reds to nightmare start". ESPN Soccernet. 18 August 2012. Retrieved 23 August 2012. ↑ "Norwich 2 - 5 Liverpool". BBC Sport. 29 September 2012. Retrieved 29 September 2012. ↑ "Liverpool 1 - 2 Swansea". BBC Sport. 31 October 2012. Retrieved 31 October 2012. ↑ "Udinese 0 Liverpool 1". The Daily Telegraph. London. 6 December 2012. Retrieved 7 December 2012. ↑ "Oldham dump Liverpool out of FA Cup after Matt Smith double". The Guardian. London. 27 January 2013. Retrieved 30 January 2013. ↑ "Rodgers points finger after Reds are dumped out of the FA Cup by Oldham". Daily Mail. 27 January 2013. Retrieved 30 January 2013. ↑ "Rodgers: I needed that experience". Official Liverpool Website. 14 May 2013. Retrieved 14 May 2013. 1 2 "Liverpool win the double: Sturridge and Rodgers take Player and Manager of the Month awards". Daily Mail. 13 September 2013. Retrieved 13 September 2013. ↑ "Liverpool: Brendan Rodgers fined £8,000 for referee comments". BBC Sport. 9 January 2014. Retrieved 9 January 2014. 1 2 "Liverpool seal treble as Brendan Rodgers, Suarez and Gerrard scoop Barclays Manager and Player of the Month gongs". Daily Mirror. London. 11 April 2014. Retrieved 11 April 2014. ↑ "Norwich City 2-3 Liverpool". 20 April 2014 – via www.bbc.co.uk. ↑ "Chelsea blow title race open after mistake by Liverpool's Steven Gerrard". The Guardian. London. 27 April 2014. Retrieved 8 May 2014. ↑ "Crystal Palace's Dwight Gayle blows Liverpool's title charge off course". The Guardian. London. 6 May 2014. Retrieved 8 May 2014. ↑ "Liverpool: Premier League near-miss offers hope for the future". BBC. 11 May 2014. Retrieved 12 May 2014. ↑ "Brendan Rodgers: Liverpool boss named LMA manager of the year". BBC Sport. Retrieved 12 May 2014. 1 2 "LMA MEMBERS CHOOSE BRENDAN RODGERS FOR LMA MANAGER OF THE YEAR AWARD, SPONSORED BY BARCLAYS". LMA. Retrieved 12 May 2014. ↑ "Liverpool manager Brendan Rodgers signs new deal to stay at club". The Guardian. London. 26 May 2014. Retrieved 27 May 2014. ↑ McNulty, Phil (9 December 2014). "Liverpool: Brendan Rodgers candid after exit to Basel". BBC Sport. Retrieved 10 December 2014. ↑ Whalley, Mike (26 February 2015). "Besiktas 1–0 Liverpool (agg 1–1, pens 5–4)". BBC Sport. Retrieved 2 March 2015. ↑ "Brendan Rodgers: Liverpool failing in big games, says manager". BBC Sport. 19 April 2015. Retrieved 20 April 2015. ↑ Jones, Neil (21 April 2015). "Brendan Rodgers retains backing of Liverpool owners despite FA Cup disappointment". Liverpool Echo. Retrieved 25 April 2015. ↑ Pearce, James (25 April 2015). "Brendan Rodgers says he has the full support of Liverpool owners after showdown talks this week". Daily Mirror. London. Retrieved 25 April 2015. ↑ "Everton 1-1 Liverpool". BBC Sport. 4 October 2015. Retrieved 5 October 2015. ↑ "Liverpool FC part company with Brendan Rodgers". Liverpool FC. 4 October 2015. Retrieved 5 October 2015. ↑ "Brendan Rodgers: Liverpool boss sacked after Merseyside derby". BBC Sport. 4 October 2015. Retrieved 5 October 2015. ↑ "Decision to Sack Brendan made before the derby". This is Anfield. 4 October 2015. Retrieved 5 October 2015. ↑ "BRENDAN RODGERS STATEMENT". League Managers Association. 5 October 2015. Retrieved 7 October 2015. ↑ "Celtic: Brendan Rodgers is appointed manager". BBC Sport. BBC. 20 May 2016. Retrieved 20 May 2016. ↑ "Lincoln Red Imps 1 Celtic 0". BBC Sport. 12 July 2016. Retrieved 13 July 2016. ↑ "Brendan Rodgers not embarrassed despite Celtic defeat to Lincoln Red Imps". The Guardian. 13 July 2016. Retrieved 18 July 2016. ↑ "Celtic survive Hapoel Beer-Sheva fright to advance in Champions League". Guardian. 23 August 2016. Retrieved 26 August 2016. ↑ "Barcelona 7-0 Celtic". BBC Sports. 13 September 2016. ↑ "Scottish League Cup final: Aberdeen 0-3 Celtic: Brendan Rodgers secures first silverware as Hoops boss". talkSPORT. News UK. 27 November 2016. Retrieved 28 November 2016. ↑ "100 and counting as Celts celebrate silverware success". Celtic F.C. 27 November 2016. Retrieved 27 November 2016. ↑ "Secret to Liverpool's title charge is Brendan Rodgers' ability to keep changing formation – and Raheem Sterling's gift of adapting to his manager's wishes". The Independent. London. 19 April 2014. Retrieved 8 May 2014. ↑ "Liverpool prosper from flexible philosophy of Brendan Rodgers". The Guardian. 25 March 2014. Retrieved 8 May 2014. ↑ "5 reasons why Brendan Rodgers should be Manager of the Year". The Score. 21 April 2014. Retrieved 8 May 2014. ↑ "Ex-Liverpool boss Brendan Rodgers proposes to Charlotte Searle in New York's Times Square just 68 days after signing divorce papers". Belfast Telegraph. 24 February 2016. Retrieved 24 February 2016. ↑ "Swansea City's Brendan Rodgers climbs Kilimanjaro". BBC News. 16 June 2011. Retrieved 23 June 2011. ↑ "Liverpool boss Brendan Rodgers and jockey AP McCoy receive honorary doctorates". Newsletter.co.uk. 30 June 2014. Retrieved 4 July 2014. ↑ "Brendan Rodgers signs new Swansea City deal". BBC Sport. ↑ Mawhinney, Stuart (16 July 2007). "Buck Rodgers". The Football Association. Retrieved 25 August 2010. ↑ "Mike Walters meets new Watford boss Brendan Rodgers". Daily Mirror. London. 13 December 2008. Retrieved 30 May 2012. ↑ King, Ian. "England 2008/09". Rec.Sport.Soccer Statistics Foundation. Retrieved 16 March 2013. ↑ "FC Watford" (in German). Fussballdaten.de. Retrieved 16 March 2013. ↑ King, Ian. "England 2009/10". Rec.Sport.Soccer Statistics Foundation. Retrieved 16 March 2013. ↑ "FC Reading" (in German). Fussballdaten.de. Retrieved 16 March 2013. ↑ Ian King; Jan Schoenmakers. "England 2010/11". Rec.Sport.Soccer Statistics Foundation. Retrieved 16 March 2013. ↑ "Swansea City" (in German). Fussballdaten.de. Retrieved 16 March 2013. ↑ Stokkermans, Karel. "England 2011/12". Rec.Sport.Soccer Statistics Foundation. Retrieved 16 March 2013. ↑ Stokkermans, Karel. "England 2012/13". Rec.Sport.Soccer Statistics Foundation. Retrieved 16 March 2013. ↑ "FC Liverpool" (in German). Fussballdaten.de. Retrieved 16 March 2013. ↑ "Managers: Brendan Rogers". Soccerbase. Centurycomm. Retrieved 10 June 2016. Wikimedia Commons has media related to Brendan Rodgers.